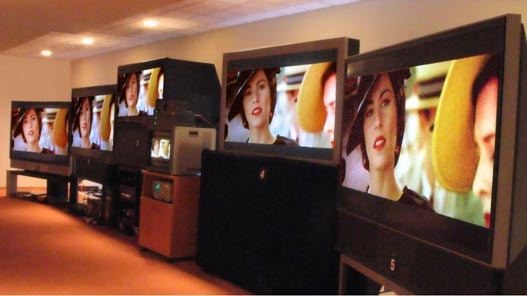 Written for Consumers and Reviewers, this set of public articles provides expert in-depth display tests, measurements, comparisons, evaluations, and analysis of OLED, LCD, Plasma, DLP, and LCoS display technologies for TV and Multimedia displays, including computer and video monitors and projectors where picture quality and color and gray-scale accuracy are important. They are based on in-depth laboratory measurements with advanced scientific data analysis using proprietary diagnostic Test Patterns in our DisplayMate Multimedia Editions with proprietary instrumentation in our world-class DisplayMate Test Lab. The articles are written by DisplayMate Technologies President, Dr. Raymond Soneira. They have been published in dozens of Consumer, Video, Computer, Professional Audio-Video, and Research publications worldwide, with an extensive readership that ranges between 300,000 and 1.2 million readers for each article. DisplayMate Technologies specializes in advanced display Lab testing with our proprietary instrumentation and sophisticated scientific and mathematical display analysis for state-of-the-art strategic comparisons and display performance optimizations in our world-class DisplayMate Test Lab. These public articles are a lite introductory analysis for general consumer audiences. For Manufacturers we provide very technically advanced display testing, objective comparisons with competing products, and our expert analysis and recommendations for improving and optimizing prototype and production display performance on a confidential NDA basis for manufacturers for product engineering and marketing. If you are a display or product manufacturer and want to improve display performance to out-perform your competition then Contact DisplayMate Technologies. DisplayMate Technologies President Dr. Raymond Soneira covers short but interesting and timely topics and issues in Display Technology together with unique commentary and analysis. Supplements our comprehensive Display Technology article series. Our in-depth article series on mobile LCD and OLED Displays and Display Technologies with Shoot-Outs for Tablets, Smartphones, Smart Watches and High Ambinet Light displays. Follow DisplayMate on Twitter for the latest Display News, Display Shoot-Outs, articles and developments for displays and display technologies in LCD and OLED Smartphones, Tablets, Smart Watches, Curved and Flexible Displays, Automobile Displays, TVs, Computer and Video Monitors, Projectors, and Multimedia displays. In this article we cover the major innovative display and display technology developments, predictions, and trends that you'll see in the near future for Smartphones, Tablets, TVs, and Wearable displays. An in-depth scientific analysis on the issues affecting watching displays at night, how their blue light spectra can affect sleep, and how to improve display viewing comfort and performance, including our detailed recommendations for both consumers and manufacturers. We analyze Apple's Night Shift and examine how new display technologies including LCDs with Quantum Dots can improve watching displays at night. An in-depth scientific comparison of Display Color Gamuts from NTSC to the latest DCI-P3 and Rec.2020, including Accurately Colorized Color Gamuts for visual comparisons between the current Gamuts so you can visually see for yourself how they differ and compare. The latest displays and TVs will need to support the newest DCI-P3 Gamut in addition to the traditional sRGB/Rec.709 that is now found on most current Smartphones, Tablets, Laptops, Monitors and HDTVs. An in-depth scientific comparison and analysis of the display performance of the 2017 LG OLED 4K Ultra HD TV with HDR High Dynamic Range and a wide DCI-P3 Color Gamut. The article measures and analyzes all 3 Standard TV Content modes: 2K Full HD, plus 4K Ultra HD DCI-P3, and the new High Dynamic Range HDR, including extensive comparisons with LCD TVs. An in-depth scientific comparison and analysis of the variation in picture quality with viewing position and viewing angle for LCDs. Most consumers are not aware that LCDs are not a single display technology, but rather a broad range of different Liquid Crystal Display technologies that have very different performance characteristics. In this article we compare the performance of IPS LCDs with VA LCDs using detailed Spectroradiometer measurements and also screen shots for visual comparisons. An in-depth scientific comparison and analysis of TV display performance and picture quality in real world ambient light viewing conditions up through 2,000 lux. For this article we used Samsung's flagship 65Q9 QLED TV, which has by far the best high ambient light performance of any display that we have ever tested, so it is ideal for demonstrating all of the issues and factors involved in display performance in ambient light. The results apply to all displays from TVs to Smartphones. An in-depth scientific comparison and analysis of the display performance of the 3rd generation 2016 LG OLED 4K Ultra HD TV with HDR High Dynamic Range and a wide DCI-P3 Color Gamut. The article measures and analyzes all 3 Standard TV Content modes: 2K Full HD, plus 4K Ultra HD DCI-P3, and the new High Dynamic Range HDR, including extensive comparisons with LCD TVs. An in-depth scientific comparison and analysis of the display performance of two 2015 Flagship OLED and LCD top-of-the-line 4K Ultra HD resolution TVs with wide DCI Color Gamuts - an LG OLED and a Samsung LCD with Quantum Dots and Full Array Local Dimming, both with curved screens. An in-depth scientific analysis of the LG OLED TV with a curved 55 inch screen. It is absolutely stunning and close to visually perfect as the result of a combination of OLED technology with a very accurate factory calibration that delivers picture quality and accuracy that is visually indistinguishable from perfect based on our extensive Lab tests. An in-depth scientific comparison and analysis of the Active Glasses 3D TV technology from Samsung and Sony with the Film Pattern Retarder (FPR) 3D TV technology with Passive Glasses from LG and Vizio, including extensive lab measurements and viewing tests together with quantifiable 3D Visual Sharpness Tests. An in-depth scientific comparison and analysis of four flagship top-of-the-line LCD and Plasma TVs from Panasonic, Samsung, Sharp, and Sony. Examines misleading and exaggerated specifications, Dynamic Contrast Ratios, Viewing Angles, Extended Color Gamuts, Calibration, Color accuracy, Gray Scale accuracy, and artifacts. An in-depth scientific comparison and analysis of eight mid-line to top-of-the-line LCD TVs with 60 Hz and 120 Hz screen refresh rates, LED backlight strobing and motion enhancement processing using moving test patterns, moving photographs, and full live video. A feature article that uncovers spec exaggeration and marketing gimmicks in displays and TVs. Topics covered include Confusing and Useless User Controls, Contrast Ratios, Response Times and Motion Blur, and Expanded Color Gamuts. We explain the issues and tell you what the real numbers are and what they really mean. DisplayMate's quick guide and recommendations on how to buy the best TV and computer monitor including things to look for, things to what out for and avoid, and tips on in-store visual testing and evaluation. The Automatic Brightness controls and Light Sensors have a major impact on battery run time for Smartphones and US power consumption for TVs, in addition to image and picture quality, screen readability, viewing comfort, and preventing eye strain. We demonstrate with extensive data that existing Controls and Light Sensors are useless due to bad design and engineering. Analyzes and compares the four leading main-stream display technologies with articles on the Primary Specs, Gray-Scale and Color Accuracy, Display Artifacts and Image Quality, and Display Technology Assessments. Analyzes and compares five Liquid Crystal on Silicon TVs. LCoS is the latest main-stream display technology, which is marketed under a variety of names including JVC's D-ILA and Sony's SXRD. Detailed performance comparisons between five main-stream display technologies. To use DisplayMate to calibrate your TV you'll need to connect it to a Windows PC. Fortunately, that's now pretty easy. Once you do this your TV will show your Windows Desktop and can then function as a giant PC Monitor so you can watch all of your applications on the TV. The LCD-Plasma Shoot-Out with the lights turned on. Photograph by Dieter Michel, PROSOUND and Medientechnik & Systemintegration Magazines, Germany. Four articles analyzing and comparing four TVs with these main-stream display technologies. A discussion on the meaning and interpretation of the primary display specifications for Black-Level, Color Temperature, Peak Brightness, Contrast, Dynamic Range, and Checkerboard Contrast for CRT, LCD, Plasma, and DLP display technologies. Detailed explanations and discussions of Gray-scale, the widely misunderstood parameter of Gamma, Primary Chromaticities, and Color Gamut for each of the display technologies. An extensive discussion of analog and digital display artifacts for each of the display technologies. The relative advantages and disadvantages of analog and digital signals and signal processing are considered, along with discussions on image rescaling, dithering, and motion artifacts. Quantitative discussions on Display Aging, Ambient Light treatments, Viewing Angle specs, Direct View versus Rear Projection, and incisive individual CRT, LCD, Plasma, and DLP technology assessments that include Strongest Points, Weakest Points, Artifacts, Future Trends and Commentary. The LCoS Shoot-Out with the lights turned on. Photograph by David Migliori. Four articles analyzing and comparing five Liquid Crystal on Silicon TVs. LCoS is the latest main-stream display technology, which is marketed under a variety of names including JVC's D-ILA and Sony's SXRD. Provides an introduction to LCoS technology and compares the panels from different manufacturers. Describes how the TVs were tested, and then examines the photometry and colorimetry of all of the TVs in detail, which provides a quantitative assessment of their color and gray-scale accuracy. Provides a revealing Test Pattern analysis, then provides a description of the extensive viewing tests by a 34 member Jury Panel, and finishes with individual Assessments for each of the units, including the Jury grades, evaluations and comments. Provides an overall assessment of LCoS technology, followed by detailed technical performance comparisons between all of the major display technologies: CRT, LCD, Plasma, DLP, and LCoS. It finishes with a discussion of the most exciting new developments in display technology that will be the subject of future articles in this series. This sidebar provides information on each TV manufacturer that participated in the Shoot-Out. This sidebar provides information on all of the hardware and software components used for the Shoot-Out.